https://www.youtube.com/watch?v=nqEE_nbRqAgIn 1993 Steven Spielberg brought his vision of Michael Crichton's novel to the silver screen with ground-breaking computer generated imagery and superbly detailed animatronics from the talents of Stan Winston and his team; famous for many special effects used in films such as The Terminator, Predator and Aliens.Now I can remember my Dad taking me to see this movie at the local cinema and that moment when the dinosaurs first appeared on screen. 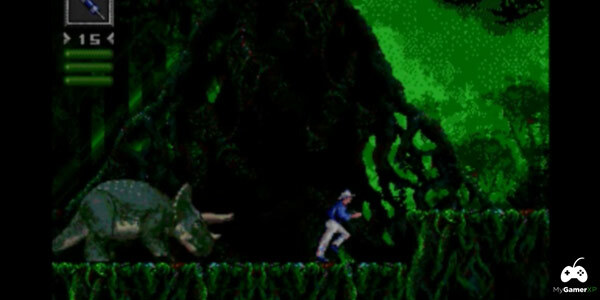 I was completely blown away!Over the next few months, Jurassic Park the video game was released on the NES, Super Nintendo and Sega Mega Drive or Genesis. They were quite different, but in this review we're going to focus on the Sega version. 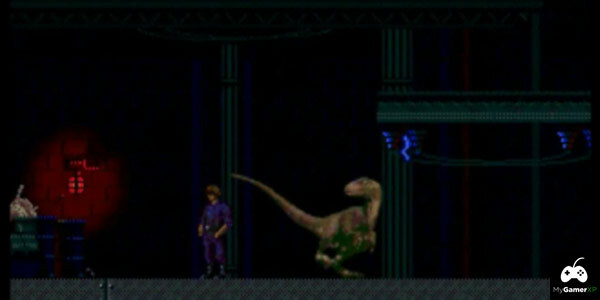 In Jurassic Park you can choose to play as a Velociraptor or Dr Grant. 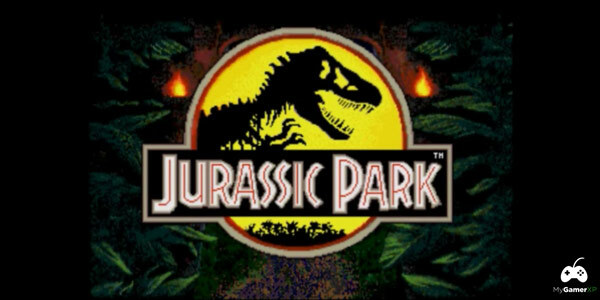 These offer two different perspectives and play styles which add a nice bit of variety to the game.Playing as Dr Grant is the default option if you just jump in and makes for quite a well paced adventure, where you must use your wits and weapons to defeat dinosaurs and escape the park. This is the most challenging character to play as, but there is a password system in place to help you continue if you die.Opting for the Raptor is a little more action-orientated. Your goal is still to escape the park, but the approach to each level is slightly different and you must kill enemies using your teeth and claws. It's a little shorter than Dr Grant's adventure as it misses out the boat vehicle level, but it's lengthy enough and an enjoyable addition. The graphics in Jurassic Park are pretty impressive. You can see the developers were inspired by the film and tried to achieve an authentic look and experience, considering the technical constraints of the 16-bit system. Games based on movies often feel like quick and lazy cash-ins, but you can see here that a lot of effort went in to the animation and environments. 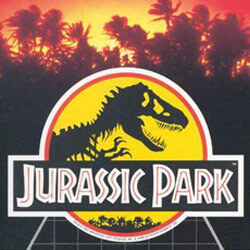 I was really quite surprised to see the detail of the intro sequences, the variation in Dr Grant's movement, traversing the environment and how good the dinosaurs actually looked.The sound is great too and whilst the theme tune from John Williams is unfortunately missing, the audio does a good job with plenty of ambient sound effects which help immerse you in the gameplay.It's a shame that so many movie tie-ins don't appear to put this much effort in their games. Jurassic Park is an excellent example of paying tribute to the film and offering players a way to experience and enjoy that world and setting for themselves. The only real downside is that the game is a bit on the short side. This is compensated a little by the presence of two characters to play as, but overall it won't take you too long to finish once you've mastered the weapons, level layouts and the initially slightly tricky learning curve. I died quite a few times in the beginning, but with a little patience and persistence I did get a handle on the gameplay mechanics and found this a very enjoyable adventure.This game would have been worth renting back when it was released and hard to recommend a purchase. However, as it can be found quite cheap now I would say pick it up if you find it for a reasonable price. If you really enjoyed Jurassic Park and like playing adventure games, you'll want this in your Sega Mega Drive or Genesis collection. It can be a little tricky at first and fairly short, but if you're a fan of the film or dinosaurs in general, this may be a game you'll want to play through a few times. https://www.youtube.com/watch?v=lx4cUoQ0QDAThe Sega Mega Drive or Genesis is one of my all time favourite games consoles.When I look around the web and talk to people on social sites like Twitter, it seems like the Super Nintendo is the most popular for collecting. It makes a lot of sense as Nintendo made and still produce some of the best quality and most enjoyable games of all time.The thing I love about collecting for the Sega Mega Drive and Genesis though is that it's often much cheaper than Nintendo, plus the condition of items is so much better. This is because they used plastic cases, instead of cardboard.So, if you're into the Sega Mega Drive, starting collecting or just interested what it has to offer, I decided to make a list which highlights what I think are the top 5 games to start your Mega Drive or Genesis collection.There's a lot of incredible games out there, but I've decided to focus mainly on the games which are fairly easy to find in good condition for a reasonable price. I've tried to avoid some of the rarer classics as I'll save that for another video/article. This is purely to help get you started. Starting at number 5 I've chosen Mega Games 2. There were a few "Mega Games" compilations on the system, but this one is my favourite. You get Revenge of Shinobi, Golden Axe and Streets of Rage all on one cartridge. This is probably the best value for money so it's an ideal place to start. There are 2 others with some good games, plus a 6-in-1 version which is a little harder to find. I recommend you look for it, but go for this if you can't find it.Revenge of Shinobi is a classic game where you get to play as a Ninja. It's quite hard with some really clever platforming and awesome graphics. Great if you enjoy a challenge. You also get to fight against Spider-Man and the Incredible Hulk in later levels!Streets of Rage and Golden Axe are side-scrolling beat-em-ups. These have aged a bit, but are still fun to play with a friend. Streets of Rage has some fantastic music and they both have a lot of replay value. At number 4 we have Lemmings, which is one of the most addictive puzzle games I have ever played. It's full of character and even has a 2 player mode. The aim is to help your Lemmings reach the goal by assigning abilities to different characters and avoiding various traps. The learning curve is well paced and I'm really surprised how cheap this often sells for. I reviewed it about a month ago and consider it an essential part of anyone's Mega Drive collection. At number 3 we have Aladdin which is a fantastic example of what the Mega Drive can do. It was actually a tough choice between this and Comix Zone, but this won me over thanks to it being a bit more accessible and cheaper to get hold of. The graphics and animation are really impressive and it does a great job of looking like the film! The levels are enjoyable, but it does get quite hard later on. I still enjoy playing it a lot regardless and it's one of my favourite games on the system. At number 2 we have Super Street Fighter 2: The New Challengers. Okay, so this one can get a little expensive at times, so feel free to go for Street Fighter 2 Championship Edition if you're trying to keep to a lower budget. They're both great games, but this is my favourite version thanks to the additional characters.I'm a big fan of Mortal Kombat and fighting games in general, but I feel Street Fighter has a much wider appeal. I've had several gaming nights where this has been more popular than any other multiplayer game. The art style, characterisation, smooth movement and tight controls make this fun for almost anyone!Chances are you're probably already well aware of what Street Fighter is and it's likely you've played this game before… a LOT of times. But, if you're just starting your Mega Drive or Genesis collection, you NEED this game! How can you own a Mega Drive and NOT have a Sonic game? At number 1 I've chosen Sonic 3. There's a lot of debate about which Sonic game is the best and to be honest I've not come to my own conclusion on this yet. The reason I picked this particular game is because it has great graphics and music, save states, a bit more narrative than the other games, plus if you get Sonic & Knuckles later on, this is the best option to expand on with new levels and routes. So you get a bit more for your money. To be honest though you can't go wrong with Sonic 1, 2 or 3. Just avoid Sonic 3D or Sonic Spinball for now. Doing a list like this is always hard and there's quite a few games that almost made it. 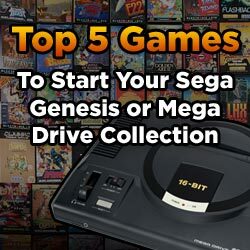 I feel that I have to mention Road Rash 2, Desert Strike, Wonder Boy in Monster World, Comix Zone and Streets of Rage 2 as honourable mentions.If you have any great recommendations or would like to know of any awesome games for the Mega Drive or Genesis, please let me know in the comments below.